RADM Long received a NROTC scholarship and attended Tulane University in New Orleans, Louisiana. He studied civil engineering with studies emphasizing structural design. He received his degree as a Bachelor of Science in Civil Engineering in 1965. In college he continued to be an active leader. He was in Delta Tau Delta social fraternity where he was elected as his pledge class President and later served as the chapter Treasurer and Vice President. He worked for his room and board by serving for three years as the Steward of the fraternity house supervising the food service for the 75 members. He was active in student government, serving as a VP of the Engineering School and was a member of the University Student Council. In the midshipman battalion he served on the color guard and was its commander his junior year. As a First Class Midshipman he was a company commander and then battalion operations officer. In his summer cruise as a Third Class Midshipman he served eight weeks on the USS Lake Champlain, a WWII vintage, straight deck carrier. They sailed out of Boston and made port calls to Halifax, Canada; New York City during the World’s Fair, and to Kingston, Jamaica during that country’s Independence Celebratio11 from the British Empire. On this cruise Midshipman Long was ranked as the top midshipman out of the 30o+ midshipmen on the cruise. As a Second Class he had aviation indoctrination at NAS Kingsville, Texas and amphibious indoctrination at NS Coronado, CA and Camp Pendleton, CA. As a First Class he had an early summer med cruise on two different destroyers and then traveled in Europe for a month with fellow midshipmen before returning to New Orleans. In his senior year he was elected to Omicron Delta Kappa, the national leadership honorary fraternity, and recognized in Who’s Who in American Colleges and Universities. Long was commissioned as an Ensign in the Civil Engineer Corps on July 19, 1965. On the 20th he married his college sweetheart, Marilyn Mildred Mayer, at Algiers Naval Station. They immediately departed for Port Hueneme, CA where he attended the Civil Engineer Officer School (CECOS). Upon completion of his course in October, 1965 he reported to his first duty station, Naval Ordinance Test Station (NOTS), China Lake, CA with an assignment in the Public Works Department. The PWO, CAPT Herb Hartman, CEC, USN, decided to make the time at NOTS a ”training tour” for ENS Long. He was given a three month assignment to the Design Division of the Department working as a junior structural engineer. Then an assignment in the Shops and Transportation Divisions learning the equipment and facility maintenance systems the Navy utilized. Finally he had three months in the office of the Resident Officer in Charge of Construction (ROICC) primarily negotiating construction contract change orders for various jobs underway on the base. CAPT Hartman then recommended that ENS Long be transferred and he was ordered to Naval Air Station, Sanford, FL to the job of Assistant Public Works Officer reporting in July, 1966. While in transit to NAS Sanford, it was announced that the base was to be closed in 1968. ENS Long was assigned as the APWO and Project Officer for the closure of the Public Works Department. On Nov 1, 1966 he was promoted to LTJG. In January, 1967 because of the buildup of forces in Vietnam and the demand for CEC officers, the PWO, a commander, was given orders without relief. LTJG Long was fleeted up to PWO. He was the only department head on the base that wasn’t an 0-6 yet had the largest budget and more employees than any other department. He worked to complete the closure and facilitate transfer of the wing and all ground equipment to its new station and then arranged the turnover of the base to GSA for its disposal. LTJG Long received orders to Naval Mobile Construction Battalion – 133 which was homeported at Construction Battalion Center (CBC), Gulfport, MS. The battalion was then deployed to Vietnam so he reported to CBC for military training and transport to the battalion. He was promoted to LT on July 1, 1968. He went through the required military training with Reserve Naval Mobile Construction Battalion-12 which had just been recalled to active duty. He flew to Vietnam with RNMCB-12 and got transportation to Phu Bia, RVN, the site of NMCB-133 deployment. LT Long was assigned as the Delta Company Commander. It is a general construction company of about 80-90 Builders and Steelworkers. His first assignment was to take approximately half of his company to Quang Tri, RVN to build a cantonment for the Marines. The cantonment was in the center of an area approximately 6 kilometers in diameter that had been defoliated by Agent Orange. The work was slow because it was monsoon season with torrential rains occurring almost daily. Nothing could stay dry in our tents and many of the men got sick with cold, sore throats and flu. After 60 days the detachment was withdrawn when another battalion was stationed in Quang Tri. During this time drinking water was supplied by shallow wells drilled by the Seabees and only had flocculation and chlorination treatments. As a result everyone at that firebase was drinking water contaminated by the Agent Orange which entered the ground water through the sandy coastal water. The balance of that deployment the company worked on projects in the Phu Bia area- steel fuel tanks and revetments for the airport, housing and galleys for the Army 101 St Airborne Division, bridge and culvert work on Route One. The battalion returned to homeport in Jan, 1969. Lt Long was awarded a Navy Commendation Medal with the Combat V for his work on this deployment. The battalion had only a five month homeport and LT Long spend a month of that leading a heavy weapons training detachment of approximately 120 men to Camp Lejeune, NC. In homeport he was reassigned as the Alpha Company Commander, the Equipment Company of the battalion. This was a “beefed up” company with 435 Equipment Operators and Construction Mechanics and over 400 pieces of transportation and construction equipment. LT Long left in May 1969 on the Advance Party for their next deployment site at Gia Lia, RVN. This was only about 10 miles from the previous site so it was familiar territory to those returning. The Alpha Company was tasked with the widening and repaving of approximately 25 miles of Route One from the peak of Hi Van Pass to the city of Hue. It ran a rock quarry and crusher, an asphalt plant, a concrete batch plant, and operated a barge offload facility on the Perfume River near Hue. In addition it did all the site work for all other battalion projects. The battalion had a backbreaking project load and worked 10-12 hour days 6 and half days a week. The battalion returned to homeport in Jan, 1970. LT Long was awarded a second Navy Commendation Medal with a Combat V, the Vietnamese Technical Honor Medal First Class, the Combat Action Ribbon, the Vietnam Service Medal, the Vietnamese Presidential Unit Citation and the Vietnamese Civic Action Medal. The battalion was later awarded the Naval Unit Citation and a Meritorious Unit Citation. While in the battalion LT Long qualified for the Expert Rifle and Expert Pistol Medals. After returning from Vietnam, LT Long resigned his regular commission and was released from active duty on June 1, 1970. He moved to Atlanta, GA where he immediately affiliated with the reserves and was assigned to Reserve Naval Mobile Construction Battalion -l4(RNMCB-14) as their Alpha Company Commander. Although administratively assigned to the local Atlanta detachment, he commuted monthly to the battalion headquarters on NAS Jacksonville for his drills. The Battalion was involved with the construction of its Permanent Drill Site (PDS) on NAS. In RNMCB-14 he had active duty for training (ACDUTRA) with the battalion at CBC, Gulfport, MS, Camp Pendleton, CA and Naval Station, Roosevelt Roads. The deployment to Roosevelt Roads was the first time a reserve battalion was sent on an “overseas” ACDUTRA. The Battalion won the Battle Efficiency “E” and the Perry Trophy as the best reserve battalion in 1972. Lt Long was promoted to LCDR on July l, 1973. LCDR Long was assigned in Sep, 1973 to RNMCB-24 which was headquartered on Redstone Arsenal, Huntsville, AL as its Operations Officer. This battalion had just gained approval for the construction of its PDS on Redstone Arsenal and LCDR Long directed its planning and initial site development. The battalion deployed to CBC Gulfport for ACDUTRA. In 1974 LCDR was assigned as Executive Officer of the battalion. The battalion did its ACDUTRA at Redstone Arsenal working on completing construction of its PDS. In 1975 it deployed to NAS Roosevelt Roads for operational training and relieved the active battalion on site, NMCB-74, for two weeks. In 1976 it went to Camp Lejeune, NC for military training. In 1977 the battalion again went back to CBC Gulfport for technical training. From Oct, 1977 until Sep, 1979 LCDR was assigned to Naval Reserve Engineering Field Division South working out of the Naval Reserve Center, Atlanta, GA. He did his ACDUTRA both years at SOUTHDIVNAVFACENGCOM, Charleston, SC working as a Project Officer primarily developing MILCON and Minor Construction project packages for SOUTHDIV supported facilities. LCDR Long was promoted to Commander on Sep 1, 1979. CDR Long transferred to the Third Reserve Naval Construction Regiment in Oct, 1979 as the Equipment Officer (RS). For ACDUTRA he lead an advance party to make arrangements for the regiment and its two subordinate battalions to conduct a regimental military training exercise at Camp Shelby, MS. In Sep, 1980 CDR Long was ordered to be the Commanding Officer to form a new type of construction force unit. The unit, Reserve Naval Construction Force Support Unit One, was headquartered in Greensboro, NC at the Joint Armed Forces Reserve Center and had four supporting detachments. The mission of the unit was to be an equipment provider of large non-battalion TOA equipment and a material deport to support a regimental sized deployment. Its personnel were primarily Equipment Operators, Construction Mechanics, and Storekeepers. The unit was successfully organized, TOA’s established, manpower recruited and was commissioned in the summer of 1981. In 1981 he spent his ACDUTRA at the unit headquarters working on its organization and in the spring of 1982 it deployed to CBC Gulfport for technical training. This was the first of four RNCFSU’s which were all in the reserve force. Two of these units were mobilized in Desert Storm/Desert Shield and later in Iraq to support the battalion construction efforts. CDR Long was selected as the Commanding Officer of RNMCB-24 and assumed command in October, 1982. The battalion went to CBC Gulfport for ACDUTRA for technical training in 1983. During its 1984 ACDUTRA the battalion conducted the first reserve Air Detachment Exercise, dubbed “Green Stinger 1-84,” from its PDS. It successfully deployed its 90 man AIRDET with its equipment within the 48 hour time frame on 30 C-130 missions to Fort Benning. GA for a military and construction exercise. The battalion won the “E” and the Perry Trophy. CDR Long was awarded a Navy Meritorious Service Medal. In Oct, 1984 CDR Long was assigned to the staff of the Commander Reserve Naval Construction Force serving one year as an Assistant Operations Officer while COMRNCF was located on Marine Corps Air Facility, El Centro, CA and a second year as the Training Officer when the headquarters was transferred to Greensboro, NC. CDR Long was awarded a third Naval Commendation Medal. CDR Long was promoted to CAPT on Sep 1, 1986 and assigned as the Officer in Charge of the Reserve Augment unit for OPNAV N-44. This unit assisted the N-44 staff in reviewing Op Plans, preparing mobilization TIPFIDS, completing Construction Resources “Country Books” and did overseas base facility vulnerability analysis. CAPT Long did one ACTDUTRA in the Pentagon in N-44 and one at Naval Station Rota, Spain. CAPT Long was simultaneously assigned to the Reserve Policy Board of the Chief of Navy Reserve doing additional active duty at CNAVRES headquarters in New Orleans, LA on a quarterly basis. He served on this board for two years. deployed to the Naval Station, the Naval Weapons Station or the Naval Recreation Facility. They removed debris, reroofed buildings, repaired security fencing and gates, and did repairs to family housing and the hospital. The Regiment and its units were given letters of commendation from LANTFLEET and approximately 250 men were awarded the Humanitarian Service Medal. CAPT Long completed his normal two year tour but was retained as commander until a change of command in April, 1991 when he was fleeted up to Deputy Commander, Reserve Naval Construction Force. During this period, CAPT Long served three years as a member of the Secretary of the Navy’s Reserve Policy Board. It met quarterly at the Pentagon with an additional two weeks of Special ACDUTRA each year there for producing its annual report. In the next three years, working for two commanders, he ran the day to day activities of the RNCF staff. He played a major role in preparing for the mobilization of three reserve battalions for Desert Storm/Desert Shield and then in the reorganization of the reserve force and integrating it with the active duty Seabees under two new organizations, the Second Naval Construction Brigade, which was based in Little Creek, VA and the Third Naval Construction Brigade based in Pearl Harbor, Hawaii. CAPT Long was awarded a second Meritorious Service Medal for his work this tour. CAPT Long was promoted to Rear Admiral Lower Half on Oct 1, 1993. Following the final reorganization of the construction force in Apr, 1994 he served until Sep, 94 as the Vice Commander of the newly formed Reserve Naval Construction Force Support Command located on CBC Gulfport, MS. Rear Admiral Long was then assigned as the Director of the NAVFAC Contingency Engineering Program with a mobilization billet as the Assistant Chief of Staff for Construction of CINCNAVEUR in London assuming these positions in Oct, 1994. The Contingency Engineering Program consisted of reserve units meant to augment NA VF AC activities in mobilization. Its 120 officers were organized into Resident Officer In Charge of Construction units, Environmental Engineering units, a Real EstateAcquisition unit, and NA VF AC field division augment units. RDML Long did his ACDUTRA at NAVFAC headquarters and numerous Special ACDUTRA periods at CINCNA VEUR headquarters and attending EUCOM sponsored joint service construction conferences. In his final assignment he assumed command of the Second Naval Construction Brigade. The Brigade reported to CINCLANFL T and commanded approximately 12,000 active duty and reserve Seabees in units supporting commands in the Atlantic theater. 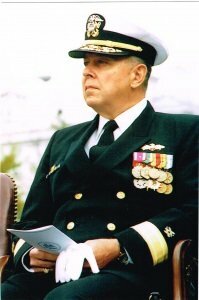 He relinquished command and retired in a ceremony at the Navy Memorial on Nov 1, 1996. He was awarded the Legion of Merit for his service as a flag officer. Since retiring Rear Admiral Long has been active in many civic, veterans, and charitable organizations and political activities. He has been a frequent speaker at civic clubs on military and veterans issues. He has served as the President of the Greater Chattanooga/John J. Splitter Council of the Navy League and is on the council’s Board of Directors. He has served as the Chairman of the Chattanooga Area Veterans Council. This council is composted of26 veterans’ organizations in Southeastern Tennessee and northern Alabama and Georgia. It is mission is coordination of veterans activities and serves as a communications channel for veterans activities and information. For CAVC he currently serves as Chairman of the Chattanooga Armed Forces Day Appreciation Luncheon. Rear Admiral Long continued his longtime involvement with the Seabee Memorial Scholarship Association currently serving on the Board of Directors and a member of the Capital Campaign Cabinet working to raise an additional $3 .5 million for the Association to use to increase the number of scholarships available for the sons and daughters of Seabees.